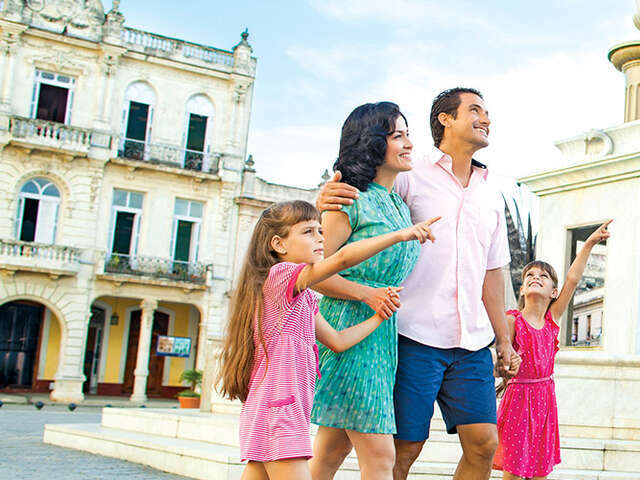 When travelling with Air Canada Vacations Cuba with the kids is one of the best choices you’ll ever make: tons of activities, warm, calm waters, and resorts for every style. Cuba with the kids is one of the best choices you’ll ever make: tons of activities, warm, calm waters, and resorts for every style. The largest city in the Caribbean welcomes you with rich heritage, glorious colonial architecture and a lively atmosphere of love, music and life. Be sure to wander the streets of Old Havana, a fascinating World Heritage Site. Inaugurated by Fidel Castro in 1973, this sprawling park makes for a great day for the family with an amusement park, an aquarium, pools and lots more. Christopher Columbus called this area “the most beautiful land that human eyes have ever seen.” Explore pristine reefs, spectacular beaches, rolling hills and a provincial capital full of life and history. A beautiful natural aquarium lets you swim with dolphins and watch trained sea lions. Be sure to enjoy some great home cooking, the mini-zoo and the lovely nature trails. One of the world’s greatest beaches! Glistening white sands stretch on forever, touched by turquoise waters and cool breezes. Here, you’ll find lots of family-friendly resorts and activities for everyone. Cuba’s largest crocodile farm is great fun for everyone, offering a unique experience of these incredible animals in a facility that has saved two species from extinction. Ringed by the whitest, softest beaches you’ve ever seen, this pristine island is a vacation paradise. Spend your time relaxing on the beach, dining at your stylish resort or exploring the wonderful natural world. At the Dolphinarium Cayo Santa Maria you get to swim, interact and have your picture taken with these graceful animals. Now, that’s a pretty great childhood memory. Tucked away in the brilliant King’s Gardens (Jardines del Rey) archipelago, these two islands offer a getaway full of white-sand beaches, great resorts, watersports, pristine nature and lots of family fun. For a new perspective, take to the water onboard a smooth-sailing catamaran. Many tours include snorkelling and lunch, so you can make a day of it.